Lavender, fuchsia / magenta center, lavender reverse. Strong, fruity, spice fragrance. 35 petals. Average diameter 3.75″. Full (26-40 petals), in large clusters bloom form. Medium, bushy, rounded. Large, glossy, dark green foliage. Height of 30″ to 4′ 11″ (75 to 150 cm). Can be used for garden. Disease susceptibility: disease resistant. 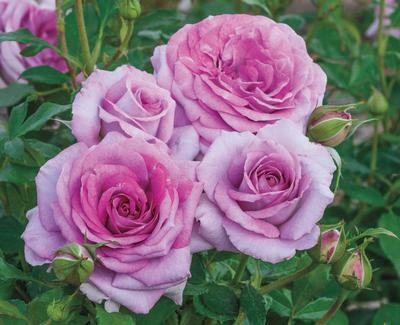 Named for the Dowager Countess of Grantham, Violet Crawley, this rose is the embodiment of the character from the PBS series, Downton Abbey. Wise and passionate, she is a witty spitfire to the core and has a likability about her that makes her one of the most memorable characters. The fragrance of sugary fruit with some spice for good measure. Hybridizer: Christian Bédard (United States, 2016).